My son Kai and I had an amazing time learning from everyone at Hangloose Surf School. I was amazed to see Kai catching waves by himself at the end of the first day. We’ll definitely be back next summer. My son, Sage, first started surfing at Hang Loose Surf Camp this past summer and his surfing skills improved dramatically! Now we can paddle out together in 4 to 5 foot waves and he’s not intimidated. The Hang Loose staff really jump started my son’s love for surfing. 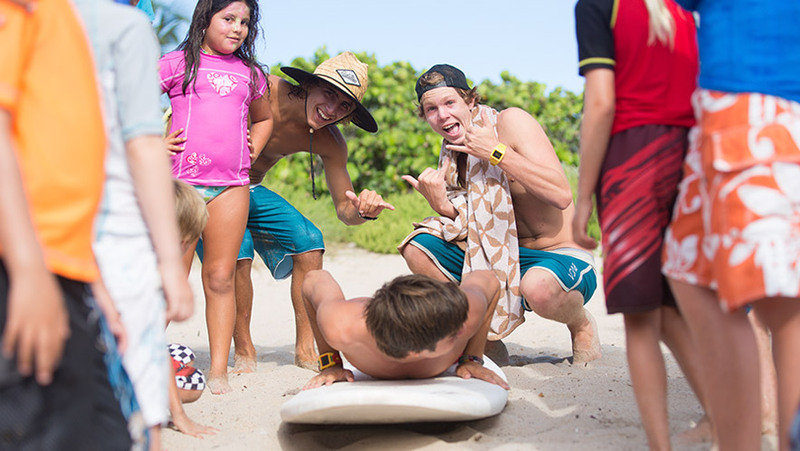 Of course, it helps that Dutch (the head dude) is an avid surfer who loves nothing more than teaching the kids to surf! I appreciate the caring and responsible nature of all of the instructors. The kids are taught to help each other out like family and my daughter has learned great swim and surf skills. Most important, she discovered awesome things about her strength and determination. Hang Loose Surf School has not only helped me become a better surfer, but they have become my second home.